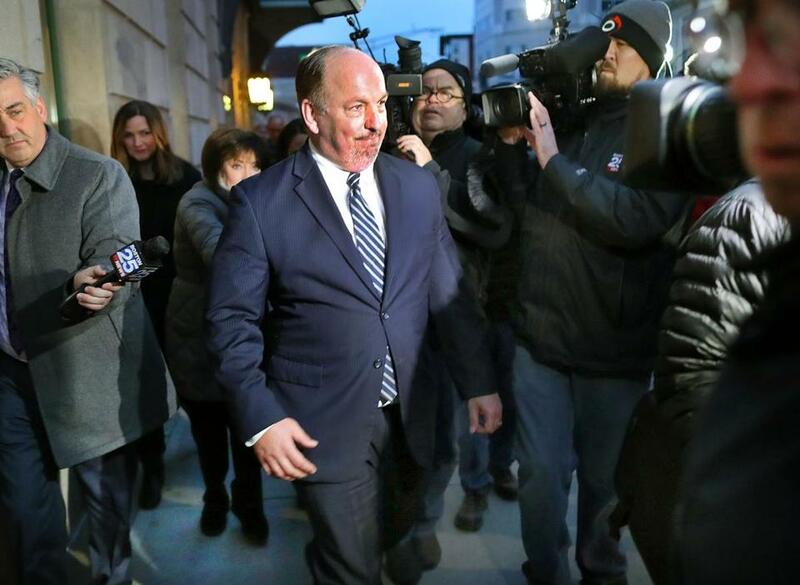 Former Massachusetts State Senator Brian Joyce leaves the federal courthouse in Worcester after he was released after posting bond. Federal prosecutors have asked a judge to disqualify prominent defense attorney Howard Cooper from representing Brian Joyce in his corruption trial, arguing that the former senator “entangled” him in a coverup. Cooper submitted “false and misleading” answers to the state Ethics Commission, including a backdated invoice for Dunkin’ Donuts coffee that Joyce had received for free, prosecutors alleged in a motion filed Monday. Cooper told the commission that Joyce had paid full price for the coffee, which Joyce gave to his Senate colleagues as gifts. Defense attorneys typically rely on information provided by clients in preparing their cases. But prosecutors allege Cooper has a conflict of interest because he “was a participant in, and has first-hand knowledge of” key events at issue in the trial. Prosecutors indicated Cooper will be called as a witness if the case goes to trial. Prosecutors said they did not know if Cooper intentionally provided misleading information but claim that documents suggest the veteran attorney could have investigated the accuracy of Joyce’s filings more thoroughly. “The government has not alleged any wrongdoing by Mr. Cooper,” Stern said. According to several veteran attorneys, it is extremely rare for prosecutors to seek to disqualify a defense lawyer. “But [this motion] is a stain on your reputation and Howard Cooper has a terrific reputation,” Kesten added. Since winning a $2 million lawsuit against the Boston Herald in 2005, Cooper has become the go-to attorney for judges inside and outside Massachusetts who feel defamed by news reports. Joyce, a lawyer who served as assistant Senate majority leader, faces 113 counts of corruption and racketeering. Prosecutors allege he received $1 million in bribes and kickbacks laundered through his Canton law office. He chose not to run for reelection in 2016 and moved out of Milton, his longtime hometown, after the FBI and IRS raided his law office. A month after Joyce’s indictment in December, his accountant John Nardozzi was charged with helping Joyce bilk the government out of more than $1 million in federal taxes. Howard Cooper submitted ‘false and misleading’ answers to the state Ethics Commission, prosecutors allege. The federal indictment portrayed Joyce as a greedy politician who considered public service secondary to his goal of secretly amassing wealth. In the latest court filing, prosecutors asked US District Judge Nathaniel M. Gorton to subpoena Cooper’s client files involving Joyce. The judge could then review the files in private and decide whether Cooper should be disqualified from representing Joyce, the motion states. While lawyer-client records are generally shielded from public or judicial review, a client cannot invoke the confidentiality privilege if he used a lawyer to foster a crime, according to prosecutors. Joyce took “numerous steps” to conceal his corrupt behavior — aided by statements and filings by Cooper, according to prosecutors Dustin Chao and William Bloomer. The state ethics commission began investigating Joyce after a series of stories detailing alleged wrongdoing appeared in the Globe. Shortly afterwards, Cooper submitted the false documents, prosecutors alleged. For example, after the Globe asked Joyce whether he had paid for Dunkin’ Donuts coffee he distributed to Senate colleagues, Joyce allegedly had someone create a fake invoice and backdate it. Cooper, at the time, submitted the invoice to the commission and insisted — to the Globe and the commission — that Joyce had paid full retail price. After the Globe reported that Joyce did legal work for and owned stock in a Peabody insurance company, Energi, while pushing the company’s agenda on Beacon Hill, Joyce “took numerous steps to conceal the extent of his relationship” with the company, prosecutors alleged. Those steps included using an attorney at Cooper’s firm “to advance false and misleading responses” to the ethics commission and the Globe. Cooper’s co-counsel said the US attorney’s motion is out of bounds.